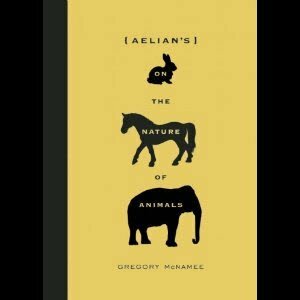 Thus opens the first entry in On the Nature of Animals, written by Claudius Aelianus in the days of imperial Rome, now freshly translated by Gregory McNamee and presented in an attractive, modern-looking edition by Trinity University Press. It is a fun book, of the type that rewards opening at random and reading in bits and pieces, because bits and pieces are what it is made of — traveler’s tales, quotes from Pliny the Elder and other early naturalists, and even stories that Aelian himself acknowledges as probably false. Despite the last group, this is not merely a collection of just-so stories. Rather, it is much in the nature of a cabinet of curiosities — everything is assembled in the hopes that it may all, however improbably, be of some use in the search after truth and wisdom. In this, despite the dubious nature of some of the anecdotes, the work on the whole succeeds. Aelian delves into not only the taxonomical (noting that India has the largest peacocks in the world and “green-colored pigeons that, if you did not know better, you would say were parrots”) but the sociological (In Egypt, near Lake Moeris… you can see a tomb for a crow”) and the theological (recording that Crete has no owls as a special dispensation from Zeus.) A subject that Aelian returns to again and again is the still-contentious issue of the animal mind, and to what degree the creatures he describes can be accurately said to learn, reason, and have morals. But the book is never heavy, because accounts of the filial piety of lions and monogamy of crows are mixed with items like “The Hedgehog is a spiteful creature. When it is caught, it pisses all over itself, so that the fur is unfit to use, even though it could be put to many good applications.” If that’s the sort of thing you find amusing, or if you want to know how to use a hawk’s bone as a magnet to attract gold or exactly why those shearwaters are being so nice to the Greeks, you might want to add this little curiosity of a book to your own cabinet. So that is where Cor(e)y’s or rather Scopoli’s Shearwater got its scientific name from! I had not known this. I looked up Aelian on wikipedia, and you might be surprised – if you find the hedgehog tale amusing – what he has to say about the Beaver as cited on wikipedia. Those were fun times for scientists, before the scientific method was established.